As a water sign, Cancer in astrology relies on their emotions to size up a situation. This means Venus in Cancer is quite sensitive when it comes to dealing with love and relationships. They are very cautious when meeting someone new, and they are careful not to rock the boat when committed. Venus represents romance, balance, finance, friendships, love, affection, marriage, relationships, pleasure, and the value we place on objects and leisure. 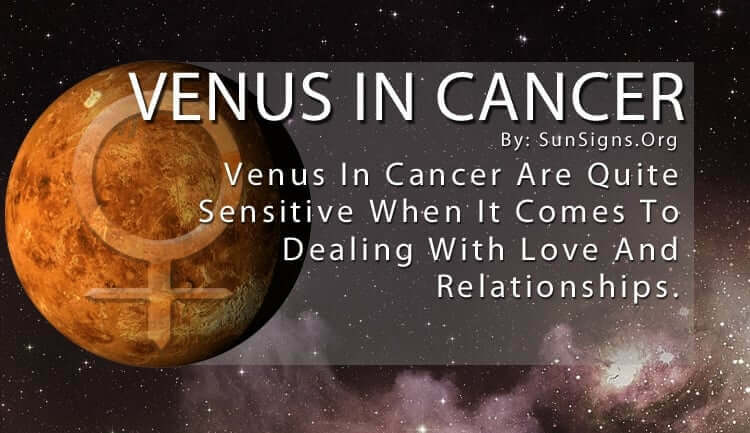 Venus in Cancer shows their affection through unconditional love by caring for everyone in their close social circle. They will bend over backward, sometimes at the expense of their own health, to make sure others are comfortable before themselves. Rather than using logic or reason, they feel their way through complicated problems and pay attention to how their lover is feeling. The Cancer Venus people are great listeners who intuitively know what other people need to feel better. They are always focused on security and comfort, and hate when things get chaotic or melodramatic (except when they create the melodrama). They have been known to bring about their own complications, especially when they feel others aren’t taking them seriously or giving them enough praise for their caring actions. Because Venus in Cancer is so concerned with stability, they work hard to maintain a cozy household for friends and family to enjoy with them. So their home becomes the biggest expense for them, as they will pay anything to cultivate a comfortable environment. They do have trouble sitting still, as they are always doing things for other people, but when they finally relax it’s usually for a night in with loved ones. They enjoy a casual atmosphere with a quiet background in which they can really talk with those they care about. Venus in Cancer people is prone to their own emotional outbursts, especially when they believe someone has wronged them. They tend to give others the silent treatment and have difficulty forgiving the person with whom they are upset. Anything that gets in the way of interacting with friends and family is an annoyance they don’t want to be bothered with, so they always plan peaceful outings. This is why they enjoy playing host or hostess so much. It gives them the opportunity to control the noise level being in their own home. Venus in Cancer zodiac sign needs to feel secure at all times, and surrounding them in a loving embrace does just that. They need constant reassurance that the relationship is solid, even when everything is going well. They are always ready for the other shoe to drop, and they need those closest to them to constantly restore their confidence. But once they are brought back on track, they will give their all to ensure things remain stable and rewarding. This helps to keep their frustration levels to a minimum, along with their mood swings. Despite the homebody appearance, Venus in Cancer is a social being who enjoys spending time with loved ones. As long as they don’t feel threatened by any unforeseen circumstances, they are a loving and dependable partner.